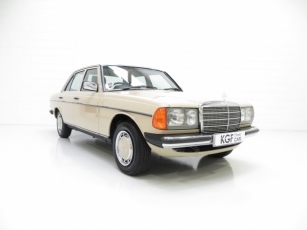 An iconic classic Mercedes-Benz W123 230E with just 42,346 miles from new. Wide opening doors, concealed ventilation slots, soft-touch door handles, laminated windscreen, crumple zones, anti-burst locks, halogen headlamps with integral foglamp, height adjustable driver’s seat, rear central armrest, noise-dampening package, twin-nozzle windscreen washer, large padded steering wheel, magazine nets, lockable glove compartment, driver’s left foot rest, interior light switch delay, ‘lights on’ buzzer, warning triangle, Mercedes-Benz tool roll, central locking, lamp in rear, oil pressure gauge, fuel reserve light, quartz-crystal clock, first aid kit. Factory options; Automatic transmission with Tempomat, Tempomat cruise control. Dealer options; Tailor made overmats. 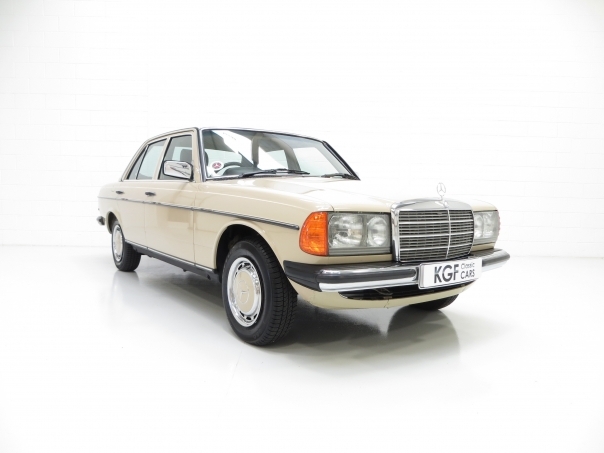 This elegant and refined Mercedes-Benz is finished in Pastel Beige, (code 684) and displays a fantastic glossy shine and uniform finish. The underside is structurally perfect and all factory panels are straight with linear gaps. There is a small isolated area on the nearside rear arch where a scratch has been lightly touched in along with two minor scratches on the bonnet. All chrome bumpers, radiator grille, door mirrors door handles and window surround are immaculate. Beautifully preserved in original state, this example even displays the supplying dealer rear screen sticker and the presentation is every inch commensurate with a 42,346 mile car. A spotlessly clean engine bay with factory stickers demonstrate just how original and cherished this car is. A wonderful example of elegant design, legendary build quality and remarkable engineering. Wide opening easy close doors give easy access to an opulent and luxurious tailored interior. Finished in Dark Green fabric, (code 056) the upholstery is in pristine unworn order as to be expected from such a low mileage example. The anatomically shaped seats are contoured and extensively adjustable to fully support the body and offer optimum comfort. The high quality deep pile green carpets are in amazing condition having been protected from new by original fit Mercedes-Benz over-mats. As with the rest of the interior, the wood veneer remains in perfect condition and all the gauges, controls and electrics operate perfectly. The Mercedes-Benz tool roll is complete and the first aid kit is still preserved in the original polythene wrapping and housed correctly in the rear shelf stowage hatch. A minor marking to the glove box can be seen. Offering a real showroom fresh experience, the appeal of this classic W123 model is immense. The four-cylinder in-line engine with fuel injection produces 136bhp and has tremendous torque low in the engine speed range offering relaxed and flexible power delivery. Incredibly smooth thanks in part to fine engineering of all moving parts but also to an additional vibration damper on the crankshaft it offers sheer cruising pleasure. The optional four-speed torque convertor automatic transmission is seamless in operation. An absolutely flawless and assuring drive, the embodiment of Mercedes-Benz excellence. Steel wheels with original chrome Mercedes-Benz hubcaps, colour coded, remain on the car. The hubcaps are in beautiful condition with a few minor markings. Shod in quality 175/80 R14 Firestone F580 tyres with masses of tread remaining. The spare wheel housed in the immaculate boot area wears the original Michelin item. Dual-circuit power braking system with front brake pad wear indicators give the car a steady and assured feel as you would except from Mercedes-Benz. Registered new on the 1st October 1983 by Mercedes Benz main dealer M.Thomas (Continentals) Ltd of Plymouth, the first owner was a Mr J R Enoch. Just three further keepers have cherished this incredible example over an incredibly low 42,346 miles. The original stamped service booklet and many previous MOT’s and maintenance invoices are present in the history file to fully support the mileage covered. Original maintenance books, handbooks, user guides and even a sales brochure remain with the car. Rarely seen in such unmolested preserved order, this vehicle is certain to thrill a classic Mercedes-Benz enthusiast wanting a showpiece or an individual wanting to enjoy prestige classic motoring. MOT April 2015, HPI Clear.